You are currently browsing the tag archive for the ‘Only Fools and Horses’ tag. Want some help impressing the ladies? Get yourself a microcar! Rodney from the BBC show Only Fools and Horses shows you how it’s done with his Reliant Regal van. Microcars just get more useful every day! Just to change things up a bit, here’s some information about a car that is about as fugly as it gets, and also one of the symbols of British eccentricity. And even I have to admit: it is cute in its own peculiar way. The Reliant Motor Company actually started in the heart of one of the oldest bicycle manufacturers in the world, the Raleigh Cycle Company of Nottingham, United Kingdom. Raleigh experimented with motorcycles and three-wheeled vehicles in the 1920s and 30s, producing mainly delivery vehicles. Tom Lawrence Williams came onto the Raleigh staff in 1930 to push along the vehicle’s development, but he could see that Raleigh’s heart remained in bicycles. So Williams took a leap of faith and left Raleigh to start his own three-wheeler business in his garden shed. While the facility may not have been much to write home about, Williams’ intuition was correct; Raleigh shut down its motor division shortly after Williams left, prompting a few other employees to join Williams in his shed. Williams produced the first Reliant in 1934. This prototype was a 600cc van with handlebar steering and a centrally-located driver’s seat. And so Reliant was off and running. Williams formed the Reliant Engineering Company Limited in 1935 and finally moved his business out of his yard, much to his wife’s excitement. Reliant starting making all kinds of three-wheelers: pick-ups, cars, flat beds, you name it. By 1937 Williams had maxed out his factory’s capacity by producing ten vehicles a week. Not even the closure of Reliant’s engine supplier could slow the company down. “Don’t pay anyone else to make what we can make ourselves,” said Williams, and so the Reliant engine was born. Unfortunately, its inception happened about half an hour before World War II began. So Reliant, like many others, had to produce armaments for the duration of the war, ultimately producing about 1.5 million parts for Allied forces. After the war, Reliant dove right back into the micro market, producing vans and cars including the Robin and Regal models. Reliant produced the first mass-produced aluminum alloy engines in Europe and worked constantly to improve the fiberglass bodies of its cars. The cars continued selling into the 1970s, when production slowed, eventually stopping in the early 21st century. Ain't she a beaut...Del Boy got all the ladies in this van. the hearts of many Britons. 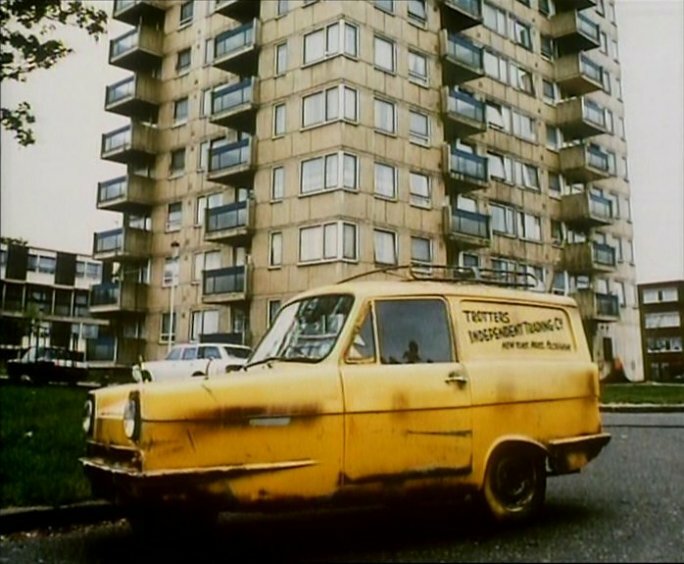 A grubby yellow Reliant Regal Supervan was the vehicle of choice for Del Boy, a cockney underhanded market trader on the fictional BBC sitcom Only Fools and Horses. In the show Mr. Bean, the main character (Mr. Bean) regularly got into conflicts and struggles with a mysterious blue Reliant Regal. Sadly, the Reliant always got the short end of the stick, usually ending up pushed away or crashed. I'm sure Mr. Bean is in hot pursuit of this poor Reliant! Even though they’re not produced today, you can still see Reliants on the streets of the United Kingdom and even the United States, particularly in the garages of avid microcar collectors.